Nick Schultz | The Phoenix Loyola redshirt senior guard Marques Townes drives to the basket in the Arch Madness semifinals March 9. The Loyola men’s basketball team received a No. 7 seed in the National Invitation Tournament (NIT) and is set to match up against No. 2 seed Creighton University March 19, the NCAA announced Sunday night. The game will be played at Creighton in Omaha, Nebraska. 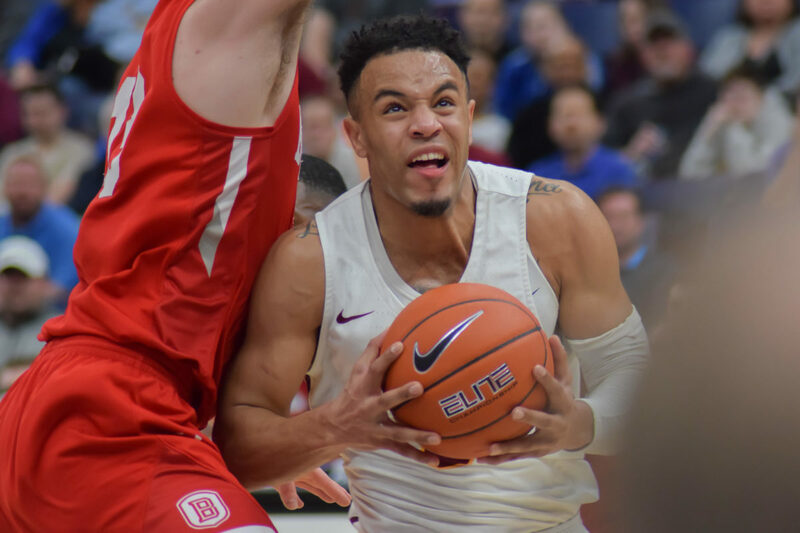 The Ramblers received an automatic bid into the NIT after finishing first in the Missouri Valley Conference (MVC) during the regular season, but losing in the conference tournament to Bradley University in the semifinals. Loyola tied for first with Drake University, but the Ramblers owned the tiebreaker after going 2-0 against the Bulldogs this season to pick up the automatic bid. 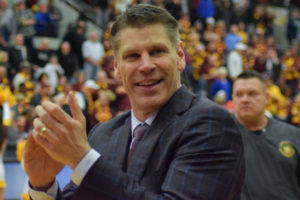 Creighton — Loyola head coach Porter Moser’s alma mater — finished fifth in the Big East Conference with an 18-14 record. The Bluejays are led by sophomore guard Ty-Shon Alexander, who averages a team-high 16.2 points per game. After making it to the NCAA Tournament Final Four last season, Loyola will make its first appearance in the NIT since 1980. The Ramblers haven’t won a game in the NIT since 1962, and the MVC hasn’t had a team win the tournament since Bradley, which made this year’s NCAA Tournament, won in 1982. Tip-off between Loyola and Creighton is scheduled for 8 p.m. March 19, and the game will be broadcasted on ESPNU.